7.4.2 – Each Club official must be clearly visible and be identified as an official. This is a pre-requisite for play proceeding, so we must oblige. Each team will receive an Official’s vest this season, so you will just have to decide who wears it! It obviously cannot be the Coach or Manager of the team playing at that time, so teams should nominate one or two other parents who can take on the job. These people should become registered as Officials, to indicate they have signed the CDSFA Code of Conduct and Child Protection forms, and so they are covered by the insurances provided by Football NSW. assist with any disputes by consulting the rule book, checking with another official, particularly the Duty Officer, or asking him/her to phone a Club committee member for clarification. Folders containing phone numbers, the FIFA “Laws of the Game”, CDSFA Code of Conduct and current CDSFA Rules of Association, plus the CDSFA small sided and and non-competitive Rules, are in the Canteen at King George. Hopefully other Clubs are as well organised!! The nice thing about volunteering for the Ground Official spot is that you generally get to watch most of the game. 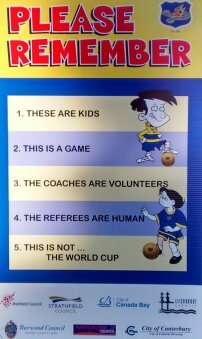 Many of the above duties will obviously not apply to under 6 to under 9 games. A Ground Official is still required at these games though, in particular to make sure parents, siblings, dogs, etc are kept back a metre or so from the sideline. Many of the smaller fields are not roped off. In all other matters pertaining to ground control, the Club & Ground Official must ensure that no conduct is permitted that would prove prejudicial to the Club or Association. We hope this doesn’t all sound too daunting!